I love this salad. I really, really do. But standing in the middle of my kitchen this past Sunday afternoon, the unfinished salad in a big bowl on the counter, I was deeply frustrated with the purple and green specks of cabbage and little bits of carrot and deep green shards of kale it had left strewn across the floor, not to mention the amount of time it had taken me to shred all of those vegetables. I am, I should note, a stickler for things like cleanliness, accuracy and correct grammar. I’m excessively fond of perfection, and I become much more distressed than is reasonable when my apartment is messy. Out-of-control to do lists and being wrong and delayed results are not among my favorite things. As an adult, I am much more willing to engage in activities that I’m not very good at, but my concern has been reassigned to other things. These include the number of emails in my inbox, the cleanliness of my kitchen sink, how many weekday mornings I make it to the gym, the amount of dust on my floors and other miscellaneous details that amount to Having It Together. I know, of course, that these things do not truly matter. And intellectually, I am well aware that no one has it together. When I am bemoaning my imperfection, I remind myself that the alternative would be highly uninteresting and that messiness has its own particular charm. I try very hard to counteract my tendency toward perfectionism with love for the people around me and appreciation of my community and cultivating balance and just living my life. I am moderately successful. I am grateful for grace. I keep trying. But last Sunday, staring at those shreds of cabbage on the kitchen floor, I actually did quite well. I scolded myself gently and brought the bowl of salad into the other room. I set it on my table and took a few photographs in the perfect sunlight that was streaming through the dirty glass of my window and onto the table and down to the old, flawed wooden floor. 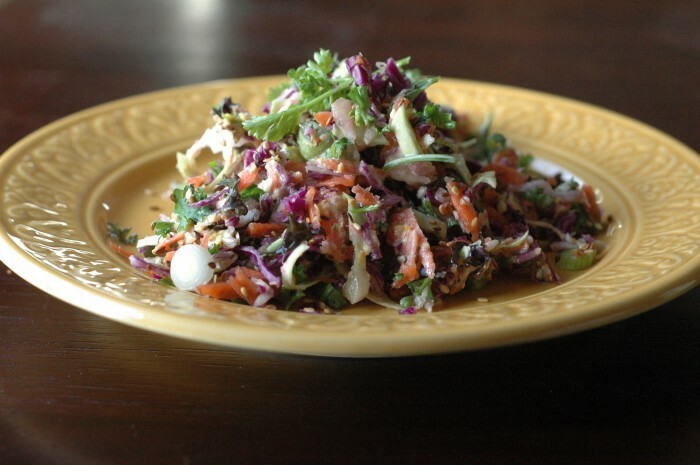 This is a delicious salad, after all, full of crunchy vegetables and toasty seeds and bright colors and healthfulness. (I felt I owed you that, at least, following all of the cake and cookies of late.) 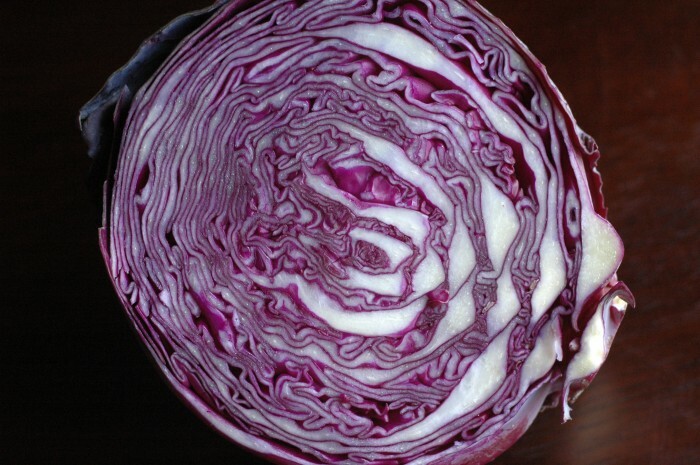 I find purple cabbage so cheery, so hopeful, so reminiscent of springtime. And this tahini dressing, though not particularly attractive, is amazing, and you will very possibly want to put it on everything. When your mouth is full of truly excellent salad, the mess in the kitchen and the messes in your life don’t really matter that much, nor does the bit of extra effort required to shred all of those vegetables before tossing them into a colorful, friendly heap. Like life itself, no? There is often a mess at the end of the day, but there is always something beautiful, too. And even the mess is charming in its own way. That’s what I think, at least. I’m far from perfect, and I’m no expert when it comes to kickball, but I do know a thing or two about salad and messy floors. Really. You can trust me on this one. The original recipe yields “a lot,” which for me was about ten side salads (most of these at a dinner gathering, a few as leftovers) and one very large lunch. The recipe below will give you half that amount. If you want lots of salad, though, go ahead and double it. 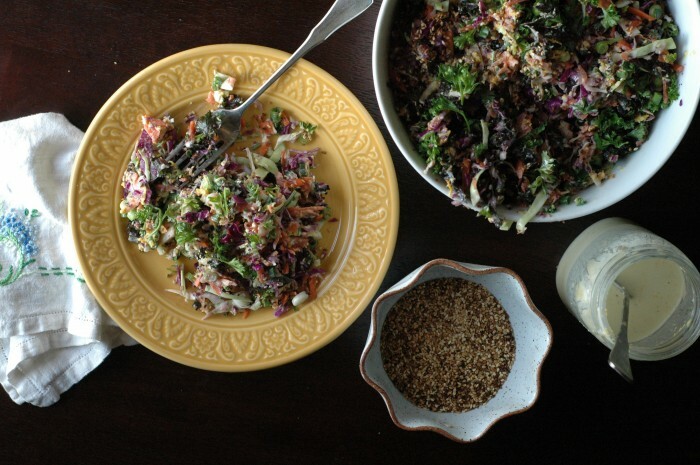 It keeps well without the dressing, and you’re getting little cabbage shards all over your kitchen anyway. Feel free to increase or decrease the stated amounts of each vegetable, or to leave one out if you don’t have it. It is a slaw. I don’t think you can mess this one up. Wash and dry the vegetables and herbs. With a box grater (what I use) or a food processor with a shredding blade (which I do not have but sometimes dream about), shred the cabbages and carrots. 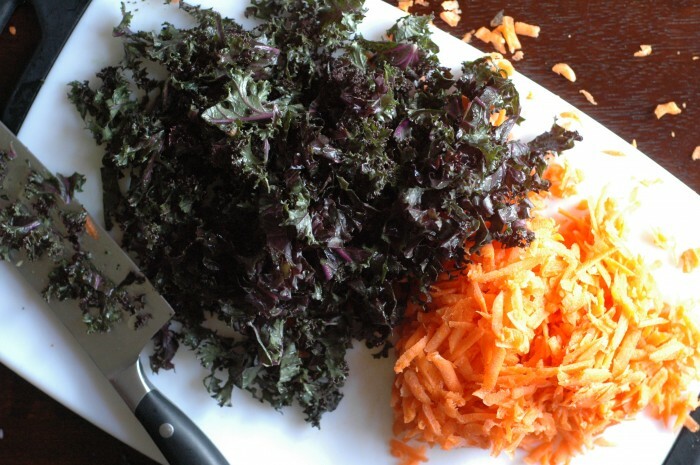 Slice the kale into fine ribbons. Slice the scallions into thin rings, and chop up the herbs. 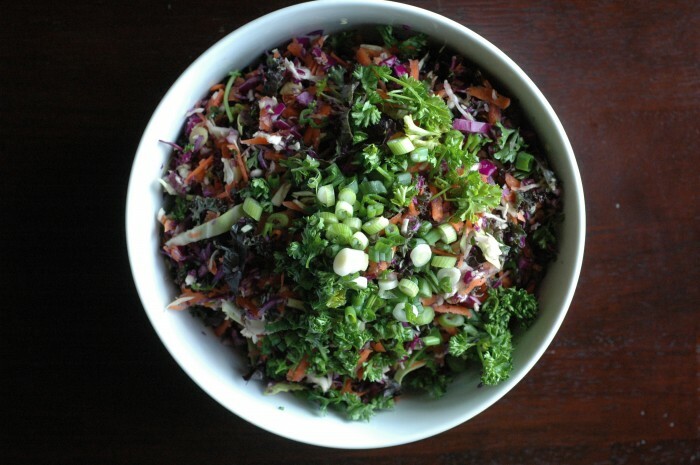 Throw all of the vegetables together in a large bowl; toss well. Toast the sesame seeds in a dry skillet on the stovetop. This might take a few minutes. Remove the skillet from the heat when the seeds are lightly browned and smell nutty. Whisk together all of the dressing ingredients except the water. Then, gradually add the water until the dressing reaches your desired consistency. 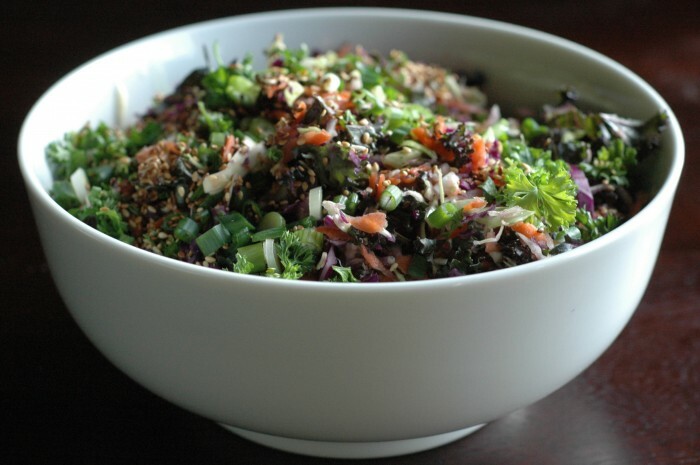 Add the sesame seeds to the salad, reserving a small handful for the top of the salad if you like, and toss again. Add dressing to taste and a bit of salt and pepper if needed. 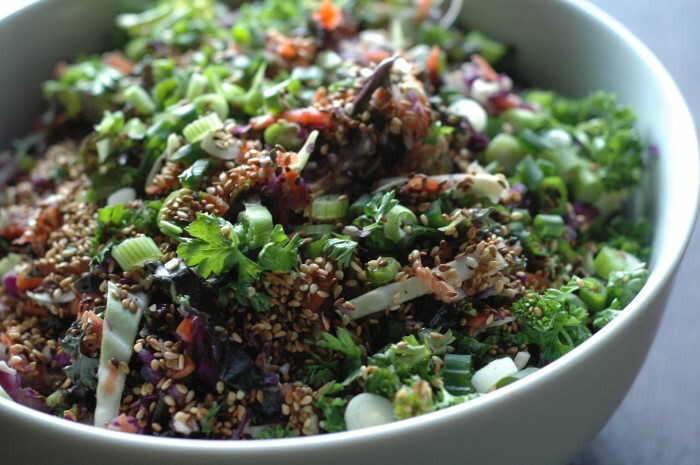 Serve garnished with the remaining sesame seeds, some parsley and/or mint and a bit more dressing atop. yes, yes yes! thank you for posting! I picked a good day to stumble upon your blog! This salad looks awesome! I admire your meticulous attention to cleanliness. I often tear through my kitchen like a whirling dervish and then sigh when I see the mess I have to clean up. Kat: I love your enthusiasm. I love the title of this. I love the actual slaw too. And I have resigned myself to the fact that a clean kitchen is nigh on impossible, try as I might. “Nigh on impossible”–yes, perfectly phrased, and also quite alright! you are so good, for so many reasons…. ah! everything you post is just what my taste-buds want. made this tonight and it is fantastic. next up, that whole wheat coconut bread. thanks. I read your post about the fig cake (yum!) and then found this. I think I’m going to make it tonight for dinner! Looking forward to Saturday. Oh, wonderful! Funny, too — I haven’t made this recipe for awhile but whipped up the dressing just last night myself! ;) Hope you enjoyed it! So glad I get to see you again soon. I finally made this salad for dinner tonight! It was so colorful and just the right side dish to go with our meal. I am purposely seeking recipes high in fiber and vegetable to counteract the rich, sweet foods we consumed over the holidays:). I will make this again, even though it did make a mess in my kitchen!